I got tagged for the first time today! Courtesy Laura at Sahm I Am. I used to make teddy bears (the old fashioned kind, with glass bead eyes and moveable arms and legs) on a sewing machine. I have no idea how to sew clothes. Totally useless at it. I love to rock climb (indoors – no putting fingers in pile of animal poo for me). I love vietnamese pho and bun. I could eat it every day. And everytime I have pho I look longingly at the bun, and when I have bun, I long for the pho. Very difficult! Now to tag – like Laura I’m new to this. Hopefully the tagees are happy to be tagged – if not please ignore the tag and accept my apologies. I have half a dozen FOUR TWO ZERO spots left for the trial. Sorry! But if you want to send me your email address missmaliceknits AT gmail DOT com I will keep you updated on how it is going with Knit Picks! Got a happy package from my uncle today – my mom sent with him some of the fabulous addi lace turbos i managed to track down in Calgary at the Knitting Room. I am not convinced I am going to knit all that faster, but picking up those pesky little stitches will be rather alot easier with the pointy tips. The cable is no where near as flexible as the Knit picks, but as these are 47″ babies, knitting 2 socks at the same time magic loop is a goer. which I am happy with. These are my on the tube socks since the pattern is an easy one to remember. But this weekend I have been a woman possessed and could NOT stop thinking about the tilting ladders pattern and knitting up the socks. Up at 6 am on Sat and the first thing I thought of was how many stitches I need to make the pattern work. Aiya. I toyed with knitting up the heavy or lightweight STR that I’ve got stashed away, but then thought the jitterbug weight was better. 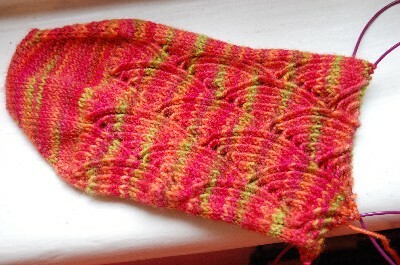 So I went with popsicle, rather than gauguin which I think I am saving for the Palooza4 socks. The ppsicle colours are a little brighter than what I’d have normally chosen (the colourway picture on the sight obviously didn’t translate well on my laptop), but I am loving the pattern so much I am not that bothered. 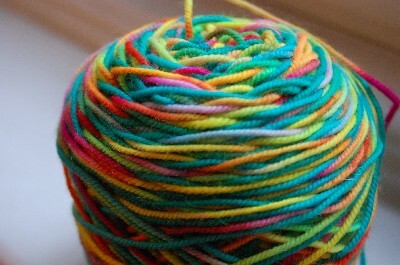 Not too sure about this yarn – it’s knitting up a little stiff. I will decide on whether I use it for Palooza after I’ve blocked (I need some sock blockers – love the wood ones, any suggestions on where to get these?) I have to say I really loved the cherry tree hill yarn – very squishy. Will have to get more! I also finally cast on for my C4 cardigan. It’s in misti alpaca baby chunky, in fuschia. It’s a top down construction, so you’re seeing the neck down bit here. the colour didn’t come out that well here (inside with flash) but it is a gorgeous hot pink colour. Soft. So soft!! Oh and postscript re the italian yarn shop I visited – BG shop was cute, very little, overlooking the river, but I was really surprised at the lack of fun and exciting yarn. Alot of synths, acrylic and furry yarn, she had like 2 types of wool sock yarn. It was a little weird, I had thought Italy would be chock full of all the amazing designer stuff. It’s unfair to make the sweeping generalisation I am about to make, but so far, IMHO, or rather more like obnoxious opinion, Canadian & American yarn rocks. Totally and absolutely. Nicked this one – too fun! Mark with bold the things you have ever knit, with italics the ones you plan to do sometime, and leave the rest. I’ve been looking at my grasshopper (only one) and thinking… should I rip, or not? To rip or not to rip – that’s the question. whether tis nobler in the craft to suffer the slings and arrows of mispurling, or in taking yarn – frog it. Difficult…. I also tried it on – it’s a tad tight, even with the lace. Sigh. I’ve put it aside for now and am concentrating on the pomotamus. 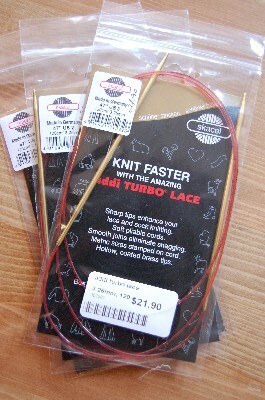 meanwhile, I’ve managed to get my grubby paws on some Addi Turbo lace – in the 40″! Called the Knitting Room in Calgary – they seemed to have loads in stock. 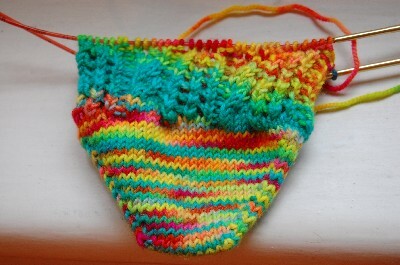 Yes – Willowluna, I promise to post a piccie when I finish the sockapalooza 4 socks! 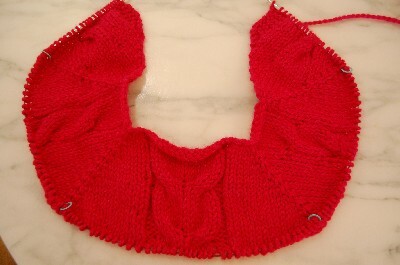 I am really excited to cast on… but I must finish my pomatomus first! Draft and String and Tuscany! I had a bunch of goodies in the post yesterday (that Liberty knit circle is a serious punch to the wallet…all my orders were placed after the wednesday meet up!) – a package from Colinette with some beautiful yarn. Gauguin and Popsicle (although Popsicle doesn’t quite look like the colourway on the site – much more green, sort of more like a tropical parrot colour) in Jitterbug. I also got a cone of cashmere in DK weight – I’m going to knit a swatch and dye it up (the colour is a marled pale pink and white). The other exciting package was from fibrecrafts which had a top whorl spindle, 300 grams each of merino top and blue faced leicester top. 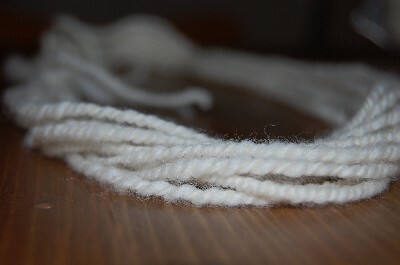 I spent some time last night playing with the spindle – I spun some wool then plied it together – i’ll have to try knitty’s handy plying technique, cause holding a centre pull ball and plying the ends together ends up twisting the yarn leading to the ball… all a bit messy. 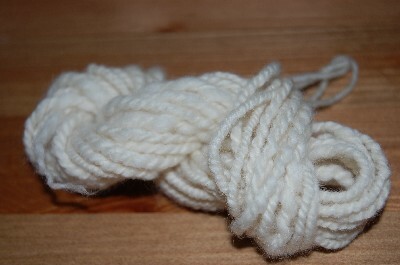 My yarn was a bit thick and thin – ranging between dk weight and aran. I spun a bit more and t looks a bit more even. After washing and hanging and then drying it – it bloomed nicely – all poofy and soft. We’ll see how the next one goes. 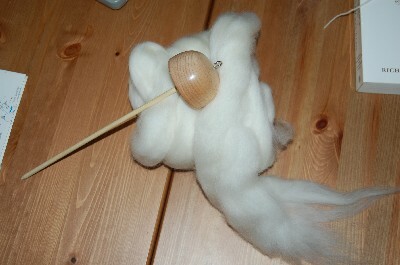 Meanwhile, am waiting to hear back from Journey Wheel about a tulip wood spindle…. and then I promise, dear, sweet, long suffereing wallet, that I shall let you rest a bit before making you work again! My little hank of merino 2 ply! 5) spin up 100 g each of merino and blue faced leicester – and dye it! Okay. That means May, June, July – 2.5 months to finish the above. Grasshoppers – another 2 weeks I am guessing, Pomatomus – 2 weeks, so that’s May gone. Cardigan – 1 month. Spinning & dying – 1 week. Phew. I better get going with all that! Ah and just back from Italy! A little yarn tour…. 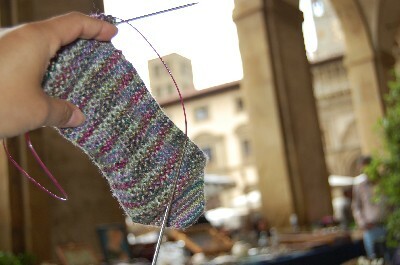 Here is the Grasshopper in an ode to the Yarn Harlot – sitting in Arezzo square, having lunch. 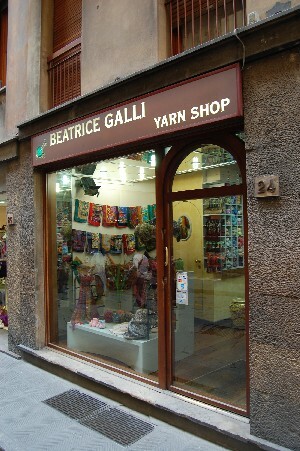 The Beatrice Galli yarn shop in Florence. Thwarted. 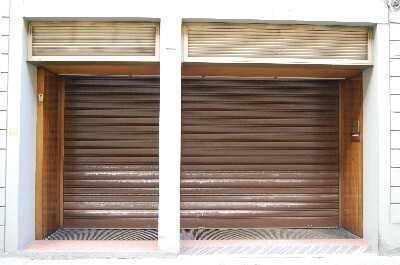 The Campolmi Filato yarn outlet – CLOSED on weekends!!! Why oh why have you forsaken weekend tourists??? And for the record – knitting needles not allowed on flights from Italy (nor flights from England). The BA World Club check in guy told me it was fine to bring knitting on board, security told me no (pulled out my Knit Pick circulars, and pointed to the needle end and said it was a blade). Sent me back to check in, the guy told me he didn’t know there were needles in my bag (duh, what the hell did he think knitting was? A ball of wool?) 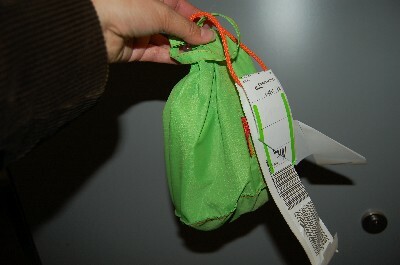 and wanted to charge me 90 euros for the pleasure of checking in my knitting bag. Thank god his supervisor said it was ok. So I checked it. and worried the whole way it wouldn’t make it. But lo and behold – here it is, at the other end. I don’t understand the idea that knitting needles are a no no, but hat pins and umbrellas and glasses made of metal (the bit that goes over your ears are long and pointy!) are all ok. Damn them nonknitting security folk. Oh ho! I have had a stroke of genius. In fact, am really pleased with myself. I had thought of doing the tilting ladders as a sock for my sockapalooza pal, but seeing as she’s part of the sock madness crew, she’ll have already knit the thing. She’s pretty much knit everything I was thinking of knitting for her – Pomatomus, Monkey, a slew of other Cookie A patterns, the Sockmadness stuff, goodness knows what else. Her list of knitted is long. Her list of to knit is also long! She’s a toughie…. so the only solution?? An Original Missmalice pattern! So I looked around. One of the girls on the Sockapalooza4 blog linked to Elfine socks, pictured here. So I checked them out on Amelia’s blog. Then I got to thinking…. I like the leaves, but not the formation. Too angular. I like flowing organic forms…. one thing led me to another, and I have it. The lace. It is beautiful and flowing. And I have not seen it in socks yet. So will make it an Original Missmalice….. Ok ok technically it won’t really be original – it is based on a traditional lace handed down through generations, but I haven’t seen it in a sock yet so I hope she’ll like it!